This is another one for all the peanut butter lovers out there, and in fact I’d be willing to bet that even peanut butter haters will enjoy this dessert! There’s something about the flavour and texture of peanut butter that makes it quite uncompromising; for some, the richness is too much on its own, and is only palatable when paired with something sweet. In the contest to be the most loved peanut butter dish, the old-school favourite peanut butter and jam is arguably winning. I would, however, argue that this cheesecake beats it hands-down. Broadly speaking, there are two classes of cheesecake: baked, and unbaked. This one falls into the latter (slightly quicker and easier) option. The general technique for the filling is very simple; make a thick puree (peanut caramel in this case, although strawberry, raspberry or chocolate also work well), and mix in cream cheese. Now simply soft-peak-whip some cream and gently fold in. 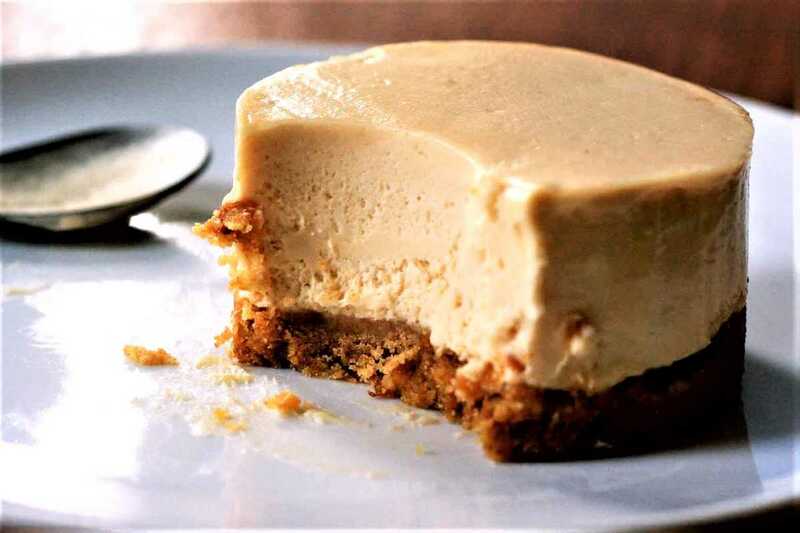 This cheesecake is mousse-like in texture and rich in taste. The biscuit base provides a nice contrast to the creamy-cheesy peanut mix that sits atop. Traditionally, Digestive biscuits have been used for a cheesecake base, but why use Digestives when you could use Hobnobs instead? After all, they taste better and it’s what Delia would do. In addition to the ingredients below, you will also need a cake ring 22cm in diameter and 5cm deep, and some greaseproof paper. To make the peanut caramel; place the condensed milk, peanut butter, golden syrup and 110g of butter in a pan over a medium heat and stir until melted. Continue to cook for 5 minutes, until almost bubbling and the caramel has thickened. Remove from heat and allow to cool to room temperature. Grease the inside of the cake ring lightly with vegetable oil or butter and line with a strip of greaseproof paper. Crush the Hobnob biscuits to a breadcrumb-like consistency, and place in a bowl along with the chopped almonds. Melt the 70g of butter, and mix thoroughly with the biscuit mix. Empty the biscuit mix into the cake ring and press into an even layer, smoothing it out with the back of a spoon. Place in the fridge to set. Once the peanut caramel has cooled to room temperature, transfer it into a mixing bowl. Use a plastic spatula to ensure you don’t waste any of it! Now add the cream cheese and mix until thoroughly incorporated. In a separate bowl, whip the cream until soft peaks form when you lift up the whisk. Fold the cream gently into the peanut and cheese mixture in 3 stages, ensuring that each stage is completely mixed before adding the next. Spoon the cheesecake mixture into the cake ring, filling right to the edges, and place in the fridge to set for at least 2 hours.